Tucked away in inner city Brisbane is this superb contemporary split level home. Camp fires…where some of life’s most contentious and philosophical topics are discussed . A while ago I discussed the 5 best trees for Brisbane. It was by no means an exhaustive list, so here I'm going to add 5 more. 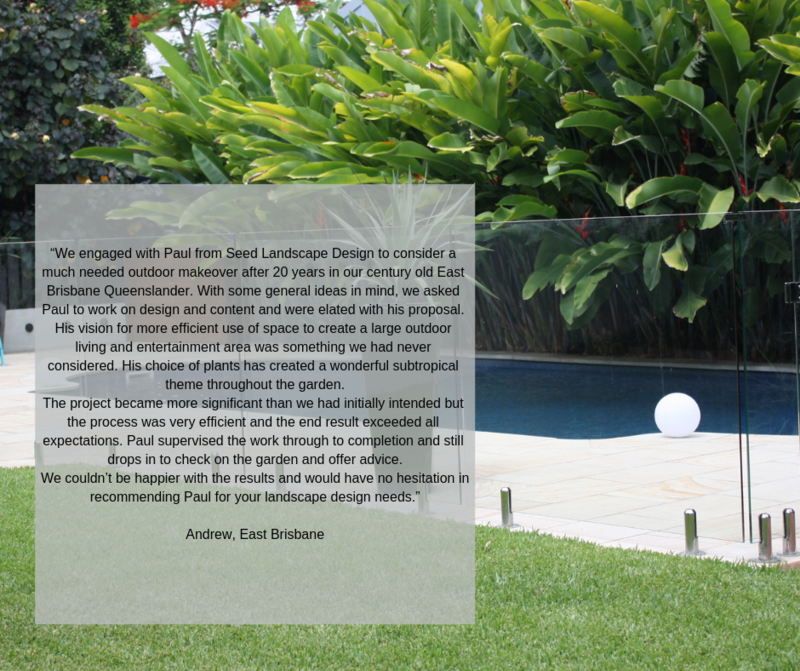 So far in our Pool Design series we have touched on location, fencing, decking and paving. Now it’s time for plants! Our discussion regarding pools and pool design continues, this time on the topic of fencing. Before taking the plunge to build your dream pool, here are our top tips to consider. Wonderful to be featured in the September issue of Home Beautiful magazine sharing tips on the pairing of sophisticated white against a lush green backdrop. `Chelmer Riverhouse' featured in the latest issue of Brisbane News. With no immediate relief on the horizon the landscapes and gardens are suffering from a lack of rain. Your garden needs your help. “We are delighted with Paul’s design. We felt that the whole Seed process was very effective in identifying what we wanted from our garden from both a practical and an aesthetic point of view and coming up with a design that met these goals. Paul elaborated on our own ideas and made some great suggestions which demonstrated a clear sympathy for our vision for the garden. “My team and I at AAD Design have been utilizing the design services of SEED Landscape Design for numerous years. My staff and I have always found Paul and his team to be professional in all of their interactions with us. We have found SEED’s design skills with commercial landscape requirements, satisfy our clients’ needs. SEED does this with their prompt delivery of services and their experience with local government codes. “SEED Landscape Design have proven to us the benefits of having good landscape design on your side when designing buildings. Greater indoor/outdoor relationships with buildings have been created when interacting with Paul throughout the design process.